Following the introduction of cattle into the Caribbean in 1493, during Christopher Columbus’s second voyage, cattle ranching proliferated along a series of frontiers across the grasslands of North and South America. While historians have recognized that Africans and their descendants were involved in the establishment of those ranching frontiers, the emphasis has been on their labor rather than their creative participation. In his recent book, Black Ranching Frontiers: African Cattle Herders of the Atlantic World, 1500-1900, historian Andrew Sluyter explores their creative contributions. 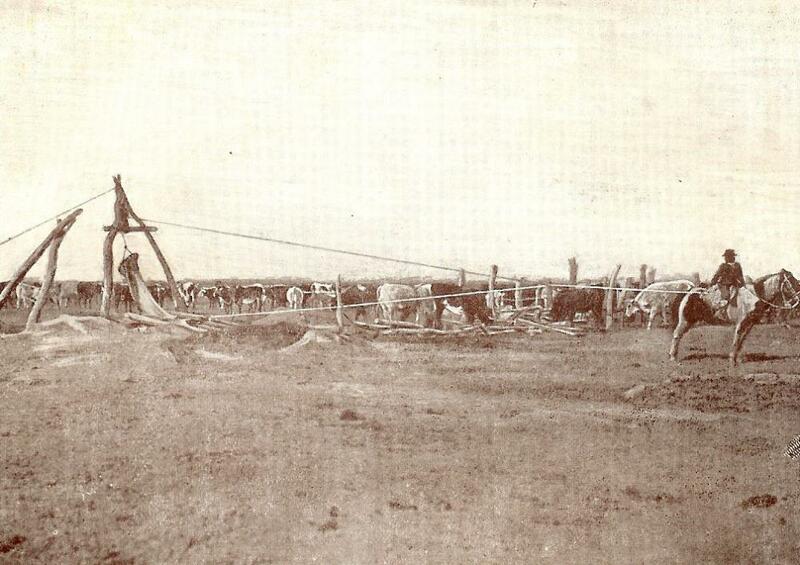 In the article below he describes one such contribution, the balde sin fondo (bottomless bucket) and its role in cattle ranching on the Pampas of Argentina. Africans did not play a creative role in establishing cattle ranching on the Pampas during colonial times. Yet by the early 1800s the presence of enslaved and free people from Senegambia (present-day Senegal and Gambia) on ranches resulted in the introduction of an African water-lifting device: the bottomless bucket, or balde sin fondo. 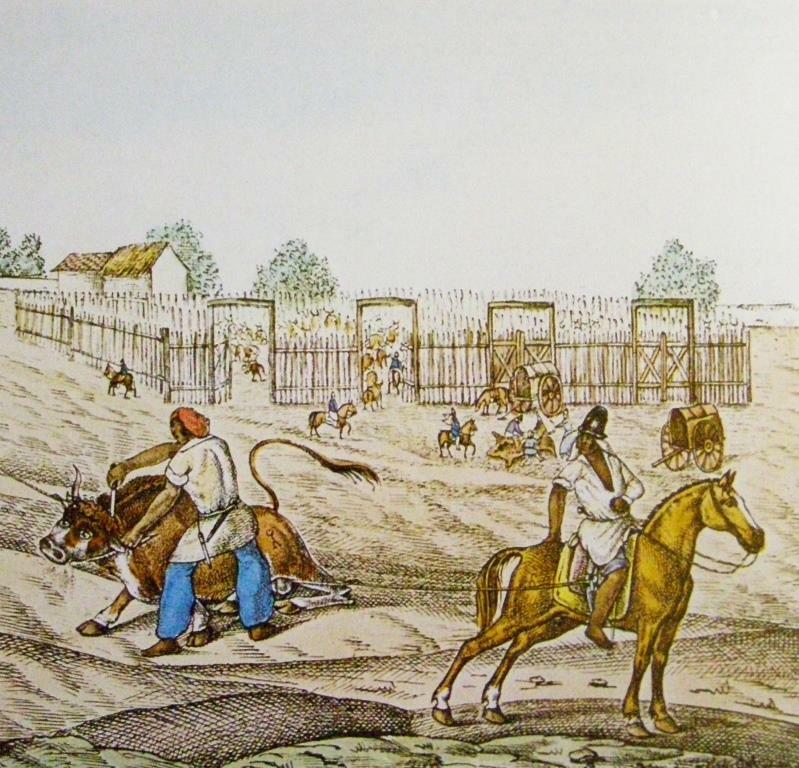 With victory over Spain in 1818, Argentinean independence, and the opening of new export markets for livestock products, ranching expanded across the vast Pampas grasslands, and new practices dramatically changed the colonial herding ecology. Africans played a particularly creative role in a key aspect of that transformation, the supplying of drinking water to the herds as they expanded into pastures distant from major perennial streams. That challenge was familiar to Senegambian herders who had to supply water during the long drive southward from the fringes of the Sahara to the banks of the Senegal and Gambia rivers as the rains ended and the vegetation of the Sahel turned from green to brown. The bottomless bucket provided the solution before windmills rendered it obsolete in the early twentieth century. The bottomless bucket lifted water from wells with the labor of a single person, even a child, on a horse. Observers at the time claimed that a single worker with a change of horses could use a bottomless bucket to water two thousand head of cattle in eight hours. It achieved that efficiency with a large, calfskin bucket that was open at both ends and had two ropes attached. A thick rope lifted the bucket and a thin rope held the bottom closed until it had emerged from the mouth of the well and could spill the water into a flume that then discharged into a drinking trough. It thereby had the capacity to raise three times as much water with each lift as the wells dating to the colonial period, which used a small bucket pulled up by hand on a single rope. The conventional wisdom has long been that in the mid-1820s a Spaniard named Vicente Lanuza invented the original bottomless bucket. That claim was first made by Carlos Pellegrini, the head of Argentina’s Office of Industrial Patents, in 1853, years after Lanuza had died, in an article in the periodical Revista del Plata. Pellegrini based his conclusion on Lanuza’s patent application of November 1826. In his application, Lanuza claimed he had invented the bottomless bucket, and in December 1826 the government recognized his creativity by granting him the exclusive right of manufacture for a period of four years. So many economic, agricultural, and environmental historians have since uncritically repeated Pellegrini’s claim that Lanuza was the inventor of the bottomless bucket that it has become conventional wisdom. Neither Pellegrini nor the many who subsequently repeated his claim seem to have realized that Africans have used nearly identical water-lifting devices for many centuries. They occur in a broad belt that stretches from India in the east to Morocco in the west and southward into the Sahel. And they date to at least the late seventeenth century, when Engelbert Kaempfer saw them in Iran and published an illustration of what appears remarkably like a bottomless bucket in his Amoenitatum Exoticarum Politico-Physico-Medicarum Fasciculi V.
That striking resemblance raises the possibility that one or more of the many African residents of the Pampas in the early nineteenth century transferred the idea of the bottomless bucket directly from Africa and that Lanuza appropriated rather than invented it. Sources ranging from newspaper advertisements and censuses to probate inventories and account ledgers all demonstrate that the rural Pampas had a substantial African and Afro-descended population from colonial times through the middle of the nineteenth century. An Argentine census of August 1815 provides the earliest detailed enumeration and reveals that Africans and Afro-descendants made up 13.6 percent of the population, 4,316 out of the 31,676 inhabitants of the rural districts that stretched from Buenos Aires southward to the frontier at the Salado River. Of the 1,402 inhabitants of African birth, some 64 percent came from West Africa, principally people of Guinea, Mina, and Hausa origin. Another 19 percent were from West-Central Africa: Angola, Congo, and Gabón. Only 2 percent came from Mozambique and Madagascar, in Southeast Africa. And 15 percent lacked any designation more specific than African. The Trans-Atlantic Slave Trade Database (http://www.slavevoyages.org) helps to further specify the Senegambian origins of many of the West Africans. That online database tabulates 67,246 disembarkations of enslaved Africans along the Río de la Plata between the 1650s and early 1830s, about half arriving before 1750 and the rest afterwards. Of the 34,280 disembarkations before 1750, 74 percent originated in West-Central Africa, 6 percent in Southeast Africa, and 20 percent in West Africa. That pattern shifted and became less concentrated after 1750, when out of 32,964 disembarkations only 29 percent originated in West-Central Africa, 45 percent in Southeast Africa, and 26 percent in West Africa. The vast majority of the West Africans, both before and after 1750, were taken from the Gold Coast (present-day Ghana), the coast of the Bight of Benin (present day Togo and Benin), and the coast of the Bight of Biafra (present-day Nigeria) rather than Senegambia. Only 2,569 West Africans originated in Senegambia, a mere 3.8 percent of the total. Nonetheless, 85 percent of those Senegambians (2,175) arrived between 1800 and 1806 from fifteen vessels variously flying the Spanish, Portuguese, Danish, and United States flags. The African and Afro-descended population of 1,402 in 1815 therefore included many Senegambians who were brought to Argentina between 1800 and 1806. The census provides much less information on the occupations of most of those rural Africans and Afro-descendants but does demonstrate that many were involved in ranching. Probate inventories from the late colonial and early national periods show some of them even owning small herds of cattle, awarded to them by wealthy ranchers to discourage escape from enslavement. One or more of those Senegambians who arrived between 1800 and 1806, might have built a bottomless bucket based on their prior experience herding cattle across the Sahel, between the valleys of the Gambia, Senegal, and Niger rivers into the southern fringes of the Sahara. Impressed by the efficiency of their water hoist, Lanuza used his social power to appropriate the design as his own invention. Much remains uncertain about the past, but no direct documentary evidence exists that Lanuza independently invented the bottomless bucket other than his own claim in a patent application through which he hoped to derive a financial benefit. 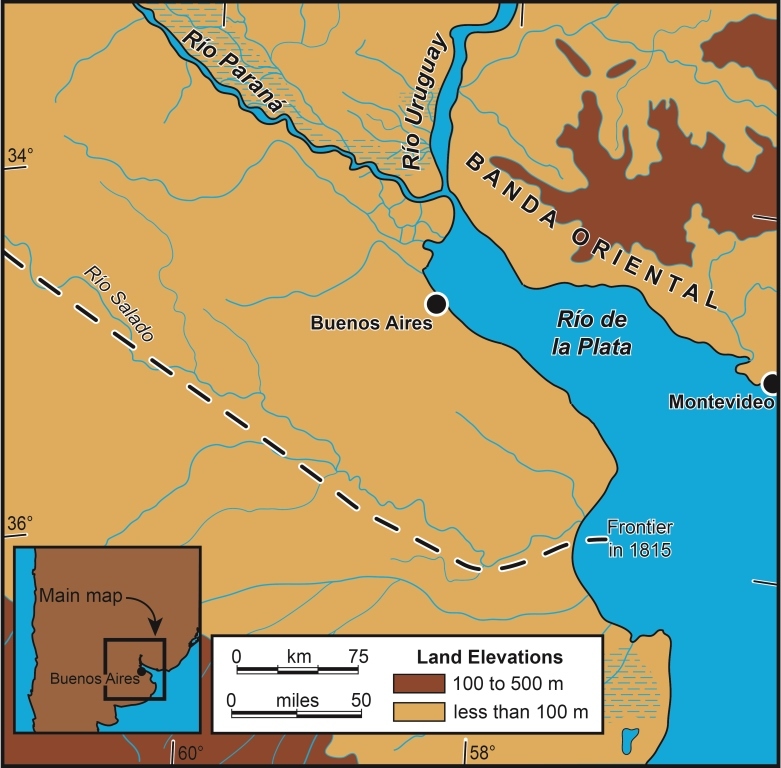 Nor, by the same standard of evidence, does any direct documentary evidence exist that one or more of Lanuza’s slaves built the first bottomless bucket on the Pampas and that Lanuza appropriated that African knowledge and labor. The second possibility, however, seems the most likely because of the many Senegambians who worked on the ranches of the Pampas in the early nineteenth century and the likelihood that some were familiar with the nearly identical form of the bottomless bucket so common in the Sahel of West Africa. Pellegrini’s claim that Lanuza invented the bottomless bucket seems the process that George Reid Andrews and other historians have shown whereby Argentinean elites consciously erased Africans and Afro-descendants from their nation’s history. With political independence from Spain the substantial African presence in Argentina began to decline. Between 1810 and 1887, their number in Buenos Aires fell from 9,615 to 8,005 and their proportion from 30 to less than 2 percent of the total population. Explanations for that decline include abolition, at least in law, of the slave trade in 1813 and the resulting reduction in the number of African arrivals. Parallel legislation emancipated children at birth and adult males through enlistment in the army, resulting in a disproportionately high death rate among enslaved males in the many regional and civil wars of the nineteenth century. Other causes for the decline of the population of African origin include disproportionately high death rates among them due to poverty and the overwhelming influx of European immigrants in the late nineteenth and early twentieth century. Politics played a particular and peculiar role in this decline. Africans and Afro-Argentinians helped form the armies that kept the dictator Juan Manuel de Rosas in power from 1829 until 1852. The liberals who ousted Rosas, such as Pellegrini and Domingo Faustino Sarmiento, characterized Rosas and his gaucho, black, and indigenous supporters as categorically backwards. They minimized the roles of nonwhites in creating Argentinean culture and society and instead promoted it as a white, European, modern, and progressive nation. White Argentines like Pellegrini were the architects of this nationalist narrative. Thus Pellegrini uncritically attributed the invention of the bottomless bucket to Lanuza and subsequent historians and others have just as uncritically accepted and reiterated that claim for the past century and a half. By becoming more critical of such received ideas about history, we can revise our understanding of how people of African origin contributed to the establishment of environmental, social, and cultural relations in the Americas. Such efforts to achieve a more accurate rendering of Argentine history as well as the histories of other multiracial societies in the New World, will allow us to understand how actors of African, European, indigenous, and mixed origins jointly participated in a creative process through which the distinct places of the Americas emerged over the colonial and early national periods. Andrew Sluyter, Black Ranching Frontiers: African Cattle Herders of the Atlantic World, 1500-1900 (New Haven: Yale University Press, 2012).